THREE men were murdered in La Canoa, lower Santa Cruz yesterday, in what police said was a case of street justice. Police initially told Sunday Newsday that two rival gangs were shooting at each other resulting in four men being shot, two dying at the scene and two others taken to hospital. Ian Garcia, 45, one of the two who was taken to hospital eventually died. Hours later the events surrounding the killings changed. Police then told Sunday Newsday that Garcia was murdered first as he and another man sat under a shed around 10.30 am. Police could give no motive for Garcia’s killing that led to the deaths of two others, saying only he “not in anything”. After he was shot, men, seeking revenge, went to upper Kingston Avenue where they opened fire on three men, killing two and injuring a third. Those killed were Francois Hall, 19, the son of a police officer and Kern “Darko” Williams, 36, of Cunupia. Residents of Dhankoo Lane where Hall lived described him as a quiet young man who “kept the wrong friends”. As they spoke with members of the media, Jamaican dancehall artiste Popcaan’s “Jah Know” played in the background on repeat, mixed with an unnamed song by Hall himself depicting why a life of crime should be avoided. The introduction to the song says “Me doh know what they kill you for”. A pair of black Nike slippers, believed to be that of Jamal Borne, who was shot and is the lone survivor of the gun attack lay on the road of upper Kingston Avenue. The two streets are connected by a track at the top of the hill. Nearing Hall’s home, the old and young, male and female, all gravitated to his home, their faces etched with pain and sadness. Every person spoken to about Hall had the same thing to say, he was a good man. His relatives said his twin sister was distraught at his death. He was a football lover and wanted to pursue it as a career. One relative described him as such a giving person that he will give the jersey off his back if asked. Residents believed the killers came looking for Williams, a stranger to the area as far as everyone knew, although they claimed he has been in the community for two years. In an unrelated killing, a 31-year-old Cumuto man was murdered at his home by four intruders. According to reports, around 4 am yesterday, David King was in his backyard when he was approached by the four men armed with guns and a cutlass. The men shot and chopped King and chopped a neighbour who sought to intervene. A motive for his killing is yet to be determined. 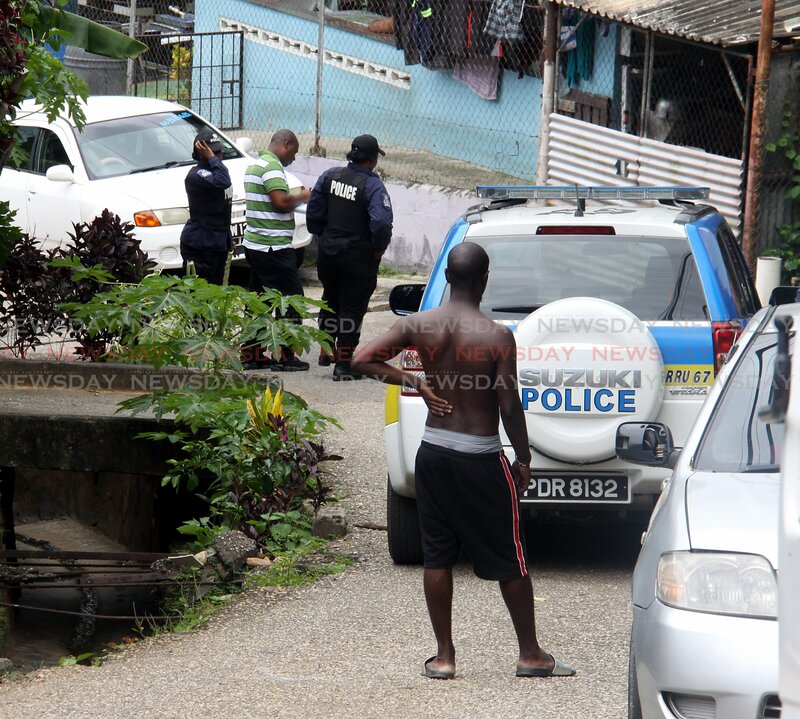 THE son of a police officer is one of three people killed today after gunmen opened fire at a group at Kingston Avenue in La Canoa, Santa Cruz this morning. Those killed have been identified as Francois Hall, 19, the police man's son, Ian Garcia, 45, and the third identified only as "Darko". A fourth man identified as Jamal Bonne is warded at the Eric Williams Medical Sciences Complex, Mt Hope in a serious condition. Police said the shooting took place around 10.45 am and both "Darko" and Hall died on the scene while Garcia and Bonne were taken to hospital. Garcia died while being treated. Residents said they have no idea what took place only that Hall "was a good one" and not known to be involved in criminal activity. In an unrelated killing, a 31-year-old Cumuto man was murdered at his home by four intruders. According to reports, around 4 am on Saturday, David King was in his backyard when he was approached by the four men armed with guns and cutlass. The men shot and chopped King. A motive for his killing is yet to be determined. Reply to "3 gunned down in La Canoa"